The previous chapter explained how Ruffus allows large jobs to be split into small pieces with @split and analysed in parallel using for example, our old friend @transform. Having done this, our next task is to recombine the fragments into a seamless whole. This is the role of the @merge decorator. @transform tasks multiple inputs and produces a single output, Ruffus is again agnostic as to the sort of data contained within this single output. It can be a single (string) file name, an arbitrary complicated nested structure with numbers, objects etc. Or even a list. The main thing is that downstream tasks will interpret this output as a single entity leading to a single job. @split and @merge are, in other words, about network topology. 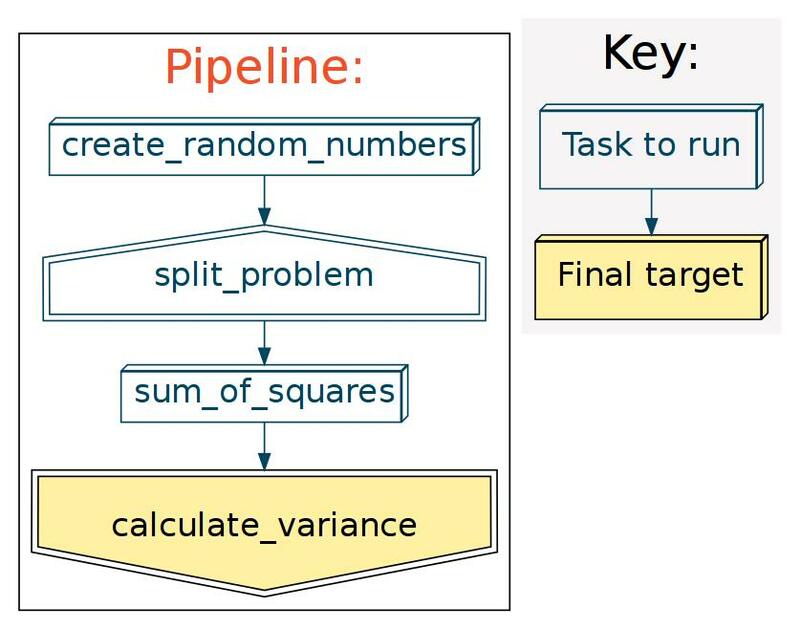 Because of this @merge is also very useful for summarising the progress in our pipeline. At key selected points, we can gather data from the multitude of data or disparate inputs and @merge them to a single set of summaries. See the wikipedia entry for a discussion of why this is a very naive approach. To do this, all we have to do is iterate through all the values in *.sums, add up the sums and sum_squared, and apply the above (naive) formula. Have a look at the complete example code for this chapter.